Her dogs have cheeky smiles and long eyelashes, they sit deep in conversation and smell huge flowers, some are doing the timid “good dog”-pose that indicates a tricky past, and some are ready for their belly rubs. Most of all, Tarsila Krüse’s dogs are happy – and they all have a lot of character. The Brazilian artist moved to Ireland 10 years ago with her husband Eric, a web designer. 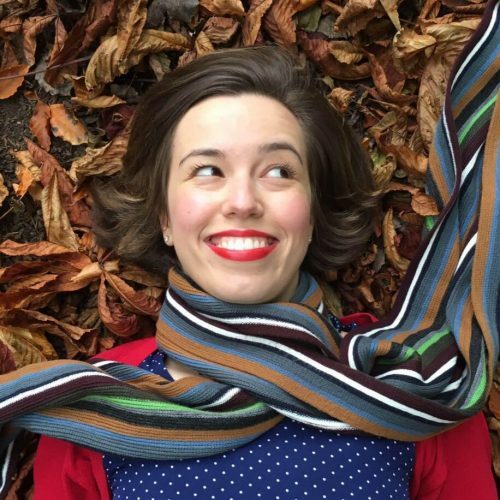 Planned as a six-month break after university, she now has a son, two dogs, runs illustration workshops in schools, and has worked with an Irish publisher – Futa Fata – for her three critically acclaimed children’s books. 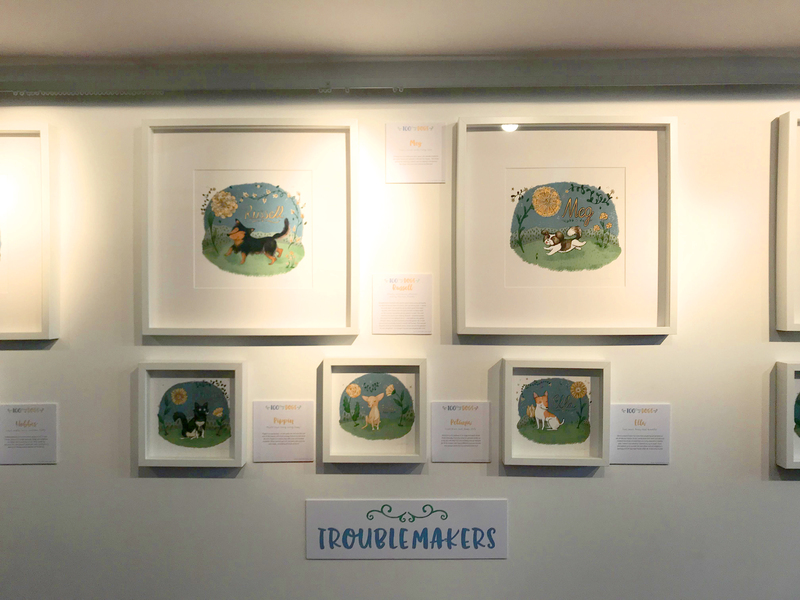 On the eve of her first solo exhibition, showing all 100 dogs from the book at the dlr Mill Theatre gallery in her adopted hometown of Dublin, Wunderdog catches up with Tarsila. How did you choose 100 dogs? Initially, the plan had been to draw 100 breeds of dogs, anything from a red setter to a dalmatian. When I posted my first drawing online, a friend asked me to draw her dog. People kept asking me, so I had lots lined up. They were mainly jack russell terriers, shih tzus and maltese – lots of people have them. I needed some variety, so I looked on Instagram and picked a few. I was a big fan of Pippa, so I just drew her. Then I compiled a list of 100 pooches. How did you gain insight into the characters of your models? I asked the owners for personal stories – illustrations on their own would not be useful. In the exhibition, I divided them into seven groups: Pippa is in the Angels group, although it’s a funny one because they are not all angels. Some are quite cheeky – one of the other dogs stole chickens from the neighbours. The other categories are Lovey Dovey, Adventurers, Troublemakers, Quirky Ones, Scared Pants, and Lost and Found – rescue dogs who rescued their owners as well; they never knew they needed a dog until they had one. How was the experience of drawing all these dogs? I have a wall of the 100 dogs at the entrance to the exhibition, where you can see the evolution of my drawing. In terms of observation, I have improved a lot. I can draw a dog with my eyes closed now. I can tell their personality by their body language; I know exactly how the legs, ears and tails move. It has definitely expanded my drawing knowledge and the process had deepened even more my love for dogs. Getting the pictures and observing the dogs – because one picture doesn’t tell the whole story. My illustrations are never based on just one photograph but on several images to see how the dog behaves. Some dogs are more expressive ­­– for example, with their ears or their pose. My dog Tag is always on his back – that’s his signature pose. What is your background as an illustrator? I’ve always drawn, but I did a BA Honours degree English in Brazil and wanted to become an English professor. After university, my husband and I weren’t sure what to do, so we took six months to live in another country. We wanted somewhere friendly that was also English-speaking, so we came to Ireland. Ten years later, we are still here. My first job here was designing Irish souvenirs – leprechauns and sheep chocolate tins, pens, key rings. Some of them are still selling, so I realised my style was commercial. I took some summer classes and co-founded illustrator collective The Blind Elephant Collective, later I joined the Illustrators Guild of Ireland and started going to illustration conventions and children’s books events. When I sent my portfolio out, I soon got a publisher. My three books have actually been written and published in Irish. You have a three-year-old son and two dogs. How do they get on with each other? I have to two jack russells, Pixel and Tag. Tag is the exhibition even though Pixel was adopted first and is my favourite. Dogs and children are a bit alike – they are both hard work, but kids are a bit harder. My son loves the dogs more than they love him. He is still a bit uncoordinated in his movements, and, as the dogs are both rescues, we don’t know what scares them. They also feel they were there first. When my son grabs food and runs, the dogs chase him, so that’s the favourite game they play. Why did you choose to publish this book yourself? I wanted to learn how a book is made from scratch and do it by myself. What I have learned is that things take much longer than you expect. You have to pay a lot more attention to detail. Every time proofs came back, I had to proof-read and review everything again… There’s a whole lot more involved than putting images and words together. I don’t think I’ll be doing 100 Days again – a shorter book would be fine. Thirty seems a good number. Are you selling the prints as well as the book? Yes. At the exhibition, people can order prints and I produce them accordingly. I can also change the names on the illustrations. So, for example, if you have a dog that looks a bit like one of the illustrations and want your dog’s name on it, I can do that. The book is for pre-order. I am printing a limited run of 100 hardback copies, which are all hand signed, and they are almost sold out on pre-order.